The United States began its quest to put man in space after the Soviet Union put the first man-made object - Sputnik - into earth orbit. Project Mercury was the first phase of that effort with the first two flights using the available and reliable Redstone stack. Technically, the project used the Jupiter C launch vehicle which had additional fuel over the standard Redstone missile. While the Redstone was a reliable launch vehicle, it only had roughly two minutes of fuel which accelerated the Mercury spacecraft and its occupant from zero to over 5,000 miles per hour in those two minutes. As impressive as that sounds (and at over 6 g's of acceleration, it was quite a ride), 5000mph is less than a third of the velocity needed to achieve orbit but it was enough energy to propel the Mercury into a ballistic trajectory well over 100 miles high and the entire flight lasted roughly 15 minutes. In all, only two people - Alan Shepard and Gus Grissom - flew aboard the Mercury-Redstone combination (not counting unmanned test flights and the famous 'Ham the chimp' flight). 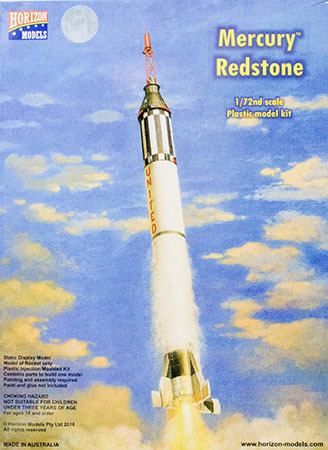 Horizon Models has returned with its fourth kit in its spacraft series, the Mercury-Redstone. We've seen the Mercury spacecraft released as a dual-kit special as well as part of the Mercury-Atlas combination. The two new parts trees provide the Redstone booster, the Jupiter 1C tank extension used for the manned flights, the spacecraft adaptor, and a launch stool. The instructions are well-illustrated and provide clear directions to replicate any of the six launch vehicles flown (the first flight did get a few inches off the pad before premature engine cut-off). Decals are printed by Microscale. So with the Redstone tooling complete, what's coming next from Horizon Models? Some of the parts for the future releases are already there. According to Horizon, they plan to release the US Army Redstone IRBM, the Jupiter C/Explorer I, and the Sparta/WRESAT versions. 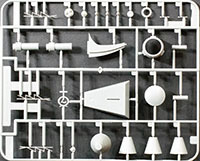 This kit is available from CultTVman Hobbyshop or directly from the manufacturer. My sincere thanks to Horizon Models for this review sample!